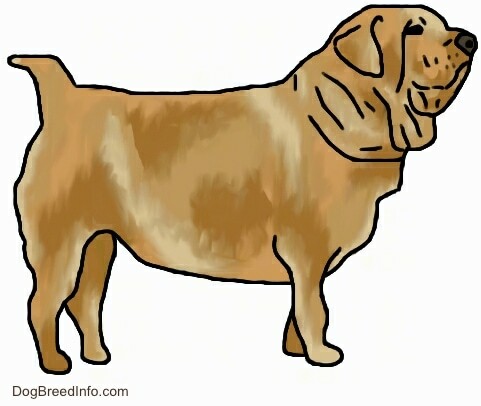 The Hawaiian Poi Dog is an extinct breed. It was short-coated, and its coat came in a variety of colors. The body was low and barrel-shaped with a destined belly and short legs. The head was large and flat due to the lack of chewing from its vegetarian diet. The Hawaiian Poi Dog was clumsy, but friendly and playful. It was said to be fat and lazy and rarely bark. 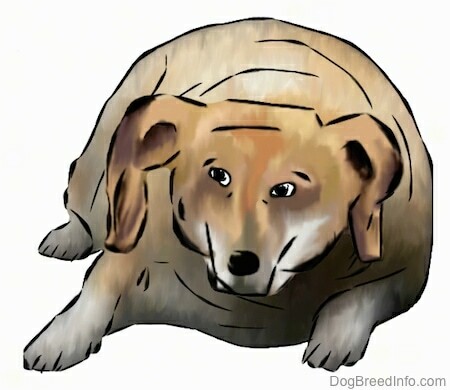 Poi Dogs were fattened up to be eaten by the tribes in which they lived. Fed a paste made from ground, baked and fermented taro root, they were sluggish and were not very smart. Hawaiian Poi Dogs liked to play with the children, but were too slow to catch the fruits the children would playfully throw at them. Lots of times they ran with the hogs, which the tribes also ate, and acted more like hogs than dogs. Weight: The dogs were overweight with distended bellies for the purpose of eating. Hawaiian Poi Dogs were fed a vegetarian diet that made them obese and gave them distended bellies and slow mentalities. The bones in their heads became flat and enlarged from lack of chewing due to this diet. They lived with their tribes, sleeping with the children, but were also eaten as a delicacy. The Hawaiian Poi Dogs were fat and lazy, waddling around like the hogs. They were usually eaten before they died of a natural death. The Hawaiian Poi Dog is a Pariah Hound that has become extinct. It came to Hawaii with the Polynesians during the first settlement more than 1,000 years ago. At one time this breed was an important part of the Polynesian people's life. The dogs lived amongst the tribes. Female tribe members took care of these dogs and even nursed Poi puppies, believing it would give them more protective instincts. The puppies were sometimes given as a gift to an infant at birth. If the child died, the dog was killed and buried with the child's body. 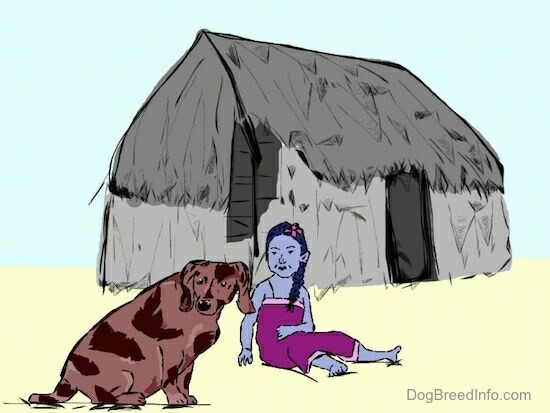 If the child out-lived the dog, the dog's teeth were pulled and made into a necklace to be worn by the child, continuing the believed "protection." The dogs were only fed poi, which is a granular paste made from the taro root. This was done to fatten the dogs up, for they were not only used as a companion, but they were also eaten by the tribe. It was not uncommon for a dog to have slept with the children one night and been eaten as the main course the next. The vegetarian poi diet made the dogs become inactive and obese and they often were found amongst the hogs. Over the years this vegetarian diet changed the shape of the dogs’ skulls. The heads became large and flat due to the disuse of the bones from lack of chewing. These dogs eventually became very lazy, waddling around with distended bellies only to be eaten at some point. It was said that they seldom barked and ran with the hogs. Early in the 19th century, other dogs began to breed with the Hawaiian Poi Dog and the breed was no longer pure. Years later, a breeding program was started at the Honolulu Zoo in attempts to reconstruct the breed. After 12 years of trying it was deemed a failure and the program was discontinued.